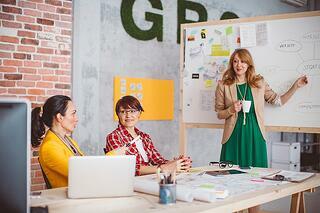 Does your company have a Content Marketing Plan? If not, it’s time to get one! It is no longer a nice thing to have; it is a must-have to succeed in today’s market. When several B2B businesses were asked about their content marketing plan, 88% said they had a plan, but only 32% are effective and successful with their strategy. Giving people a reason to listen and motivating them to act – in your direction – are the primary goals of an effective Content Marketing Program. A Content Marketing Plan is the primary tool in your marketing program. Developing, planning and sharing of valuable content to your target audience is crucial to its success. For a brief history lesson on content marketing check out this video from Content Marketing. Today’s consumers, both B2B and B2C, are tuned out to traditional channels of advertising. Banner ads, sidebar ads, and even TV ads aren’t as effective as they were in the past. Today’s consumer expects to learn more about a product or service before making a purchasing decision. The beginning of any buyer’s journey is research. Buyers want answers to their problems. The first response to a business pushing their goods or services on a customer before hearing their story, however, is rejection. Content has become the way to get that message to your customer before triggering the rejection response. 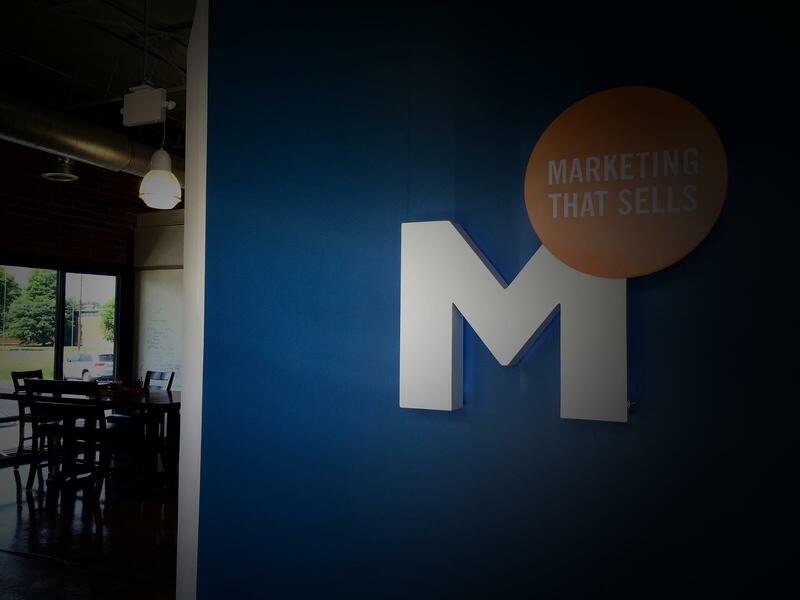 If done correctly, it has been proven to drive qualified visitors to your website every month. For more information on how this works, get a copy of “More Content Equals More Leads”. Demand Gen Report found that 67% of B2B purchasers rely on content for research before purchasing products and/or services. That is the good news, but the not so good news is that these same purchasers have 74% less time to digest content. Therefore having content is not going to be enough - it has to be great content with targeted delivery. Additionally, consumers are using a variety of mediums to receive their news and to conduct research. When building your content plan it is important to understand your market and how they like to receive information to create the right content for them. Now that you understand why content marketing should be part of your 2016 marketing strategy. Here are a few questions to get you started on creating a targeted, strategic content plan. 1) Who are you talking to? Before you even begin planning a message or content strategy, you need to know who you are talking to. Buyer persona research is a great place to start. For more information on how to create personas for your target customers, check out this blog post. It is important at this stage to be specific about your target audience. The more information you can find on them, the better you can target them with the right messaging and delivery. What do they read? How do they find information? What are they responsible for in their role? 2) What are the problems they need solved? Every purchaser in the buying cycle comes to the table with a problem for which they need a solution. Now that you have the specifics about the target customer from your research, it is time to find out what problems they might need help solving. Once you know the information that the target customer is researching, you can form questions that you can provide answer for in your content. 3) Where are they searching for answers? As I mentioned before, it is not only important to have the right content, but the right delivery as well. Where are people talking about the topics that you have identified are of interest to your target customer. 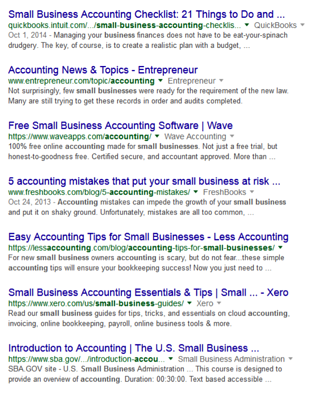 Google search – type the keywords into the search bar and review the top ranking sites. The internet is flooded with answers to just about any question. Therefore, it is crucial to understand that everyone is answering the same questions that you want to answer for your target customer. How do you stand out? Do it better! Answer questions thoroughly and better than the competition. Don’t be afraid to give away too much information. The more value you add to a reader, the more likely they are to return. How Do They Like to Receive the Information? The delivery mechanism will be affected by the form of your content. A good way to search for the most popular content type for your topics is to search social networks for popularity of your topic. 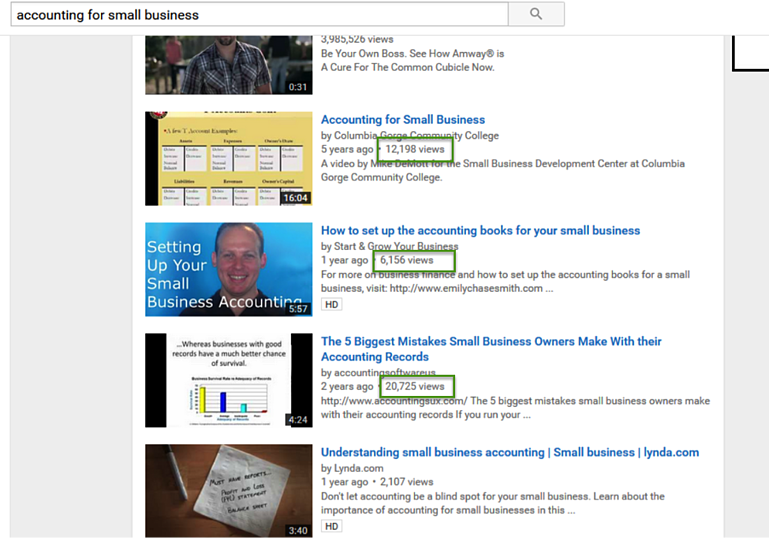 I ran a search on YouTube to see if this was a viable forum for the keywords “accounting for small business”. Based on the views for the top videos, this is a very viable option to consider. You should have a good picture of who you are talking with, what they want to know and how they want to hear the information. Put all these pieces together to build a list of potential topics to cover the questions you found in your research. Build a content calendar. Content marketing is not quick, so I would recommend building a content plan for a year. Break it down into quarters to make it easier to plan and track. Make sure you include your budget and the proper allotment of time for those items that are going to take time, such as videos, webinars, podcasts and even images. These can’t be turned out quickly and can get very costly. The only golden rule in any content strategy execution is to be consistent. One post a week is sufficient. Quality is paramount over quantity. If you can only commit to one post a month, that is fine as long as the quality is there. The key is to be consistent so your readers know when to expect your post. This answer is two pronged – publish on your own blog consistently and also submit other quality posts to niches sites you identified in your research. Never neglect the blog on your site, it serves as your storefront. Customers come to your site expecting to find new information and this is where you need to consistently deliver to draw them in and keep them there. Publishing on other sites is a bit more complicated. You can’t guarantee consistency and you are at the mercy of the blog owner. However, you shouldn’t abandon this process, it is key to expanding your reach to your target customer. Content marketing is the difference between your website being found by your target customers and not being found. It is the key to the success of your business. Take these steps into consideration when planning your online marketing strategy for 2016 and you will definitely see results in the number of visitors to your site. Any good sales person will tell you that the key is to get the customers in the door, then it is your job to keep them there to learn about your business. Want more information on how content can make or break your marketing strategy? Read more of our posts on content marketing here.